Thailand as a modern country exists since 1782, by the time when the Chakri Dynasty was founded and Bangkok was determined as the capital city. The politics of Thailand changed on 24 June 1932, when a small group of young and intellectual people carry out a bloodless coup. They were educated in western countries and have been well informed about democratic systems. This way Thailand became a constitutional monarchy instead of an absolute monarchy. King Prajadhipok (Rama VII), the leader of Thailand during the coup agreed to the new form of government in a non-violent way. The form of government in Thailand is similar to the one in Great Britain, where a Prime Minister is the head of government and the King of Thailand who is the head of state. Thailand has been ruled by many Kings before 1932. The current King Bhumibol Aduyadej (Rama IX) is the ruling Monarch from the Chakri Dynasty, that has ruled Thailand since the fall of Ayutthaya and the establishment of the Rattakosin Era. The King of Thailand is worshipped by Thai people. In his country he is both, a spiritual leader and the head of state, but he has no direct political influence. Although the King of Thailand has just a little power, he is a symbol of national identity and unity in the constitution of Thailand. People have great respect for their King because he is supporting them by solving political crises. To the welfare of the country he is urging his folk to solve their own differences in a peaceful way. The respect for the Royal Family is defined by law. It is not only unacceptable to disparage members of the Royal Family; it is punishable by law. 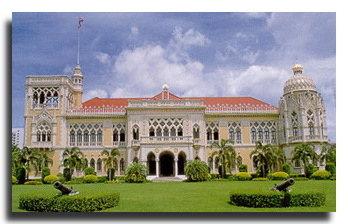 The government of Thailand consists of a coalition of political parties and the Prime Minister as their leader. To become a constitutional Monarchy Thailand went through many coups. Thai people are politically active and focus on their questionable democracy.